Most who know me, are well aware of my love for Alfred, a great productivity app for Mac OS X which aims to save you time in searching your local computer and the web. It makes me infinitely more productive and gives me endless possibilities for workflows that improve aforementioned productivity. Another little gem that has helped me control my wasted hours and thus help me focus is TicToc, a simple yet feature-full app that sits in your menubar and tracks time on various projects/tasks. Later it is possible to export tracked time to an array of formats. Finally, if you’ve read any of my previous posts (no, then go do that quick, there aren’t many yet) you will also realize my new love for the simplicity and future proof of text files. I am on a constant mission to improve my workflows and include evermore text where possible. This is where TaskPaper comes in. 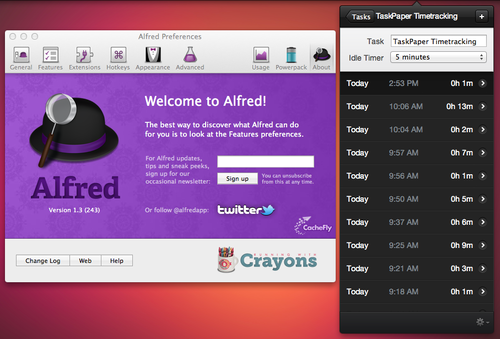 I’ve been using it on my mac to manage my tasks and have been loving it so far. It’s fast, beautiful and just plain text so it fits like a glove. No matter how great and application is, there will always be an itch. Luckily TaskPaper has extensive AppleScript support so itches aren’t to difficult to scratch. I’m referring this time in particular to Time tracking. Now there are 1 or 2 solutions over on their wiki, but I much prefer to integrate it with something I already use… You guessed it, TicToc and of course Alfred. So without further delay I give you TaskPaper Timetracking — the extension. Growl notifications of start/stop and error (fallback to dialog box if growl isn’t installed / running). @tictoc is the default “tracking” tag. The Value of this tag has to be the name of your task in TicToc. Complete some random test @tictoc(test). After the first run you can set registered to true. It’s only needed on first run in order to register the script with Growl. This would them allow you breakdown and analyze exactly how much time each part of the process took. Another great idea is to assign a global hotkey to trigger the extension, that way you can be in Taskpaper and quickly toggle time tracking for the selected task. You MUST configure TicToc to allow tracking of multiple tasks otherwise things will get confused real quick. I’ve setup a github page for this so I ask that if you find any errors please file a issue over at github.